There are 19 commodity derivatives exchanges in India now. 6.Universal Commodity Exchange Limited, Navi Mumbai. MCX has become the world’s largest commodity futures exchange in gold and silver, second largest in natural gas, and third in crude oil. NCDEX comprises of a large number of agricultural and metal commodities. NMCE’s portfolio includes major agricultural commodities and metals. The total size of commodity futures market was Rs. 170,468 billion (around $2,705 billion) outstanding in the financial year 2012-13 (Table 4). It registered a compounded annual growth rate (CAGR) of nearly 40 percent since 2003. India’s Gross Domestic Product (GDP) was worth $1,841 billion in 2012. The monthly turnover in Indian commodity exchanges is next only to the US and China. During 2011-12, the total volume of trade across all commodity exchanges in India was 140,257 million metric tonne (MT), out of which deliveries were merely 888,250 MT (0.0000006 percent). This data depicts that actual delivery of commodities is extremely low in the Indian futures markets. The composition of trading has dramatically changed in the Indian futures markets in the recent past. The share of bullion and metals rose to 65 percent and agricultural commodities declined to 12 percent in 2012-13. The movements in the international markets and foreign exchange rate influence the futures prices of bullion and metals to a greater extent. MCX is a self-governing and de-metalized multi commodity exchange. Mr.Mukesh Ambani, Chairman and Managing Director, Reliance Industries Ltd. Inaugurated MCX on November 10, 2003. It has permanent recognition from the Government of India for facilitating online trading, clearing and settlement operations for commodities futures market across the country. MCX features amongst the worlds top 3 bullion exchanges and top 4 energy exchanges today. MCX offers a wide range of opportunities to a large cross section of participants including producers/ processors, traders, corporate, regional trading center, importers, exporters, co-operatives and industry associations amongst others. 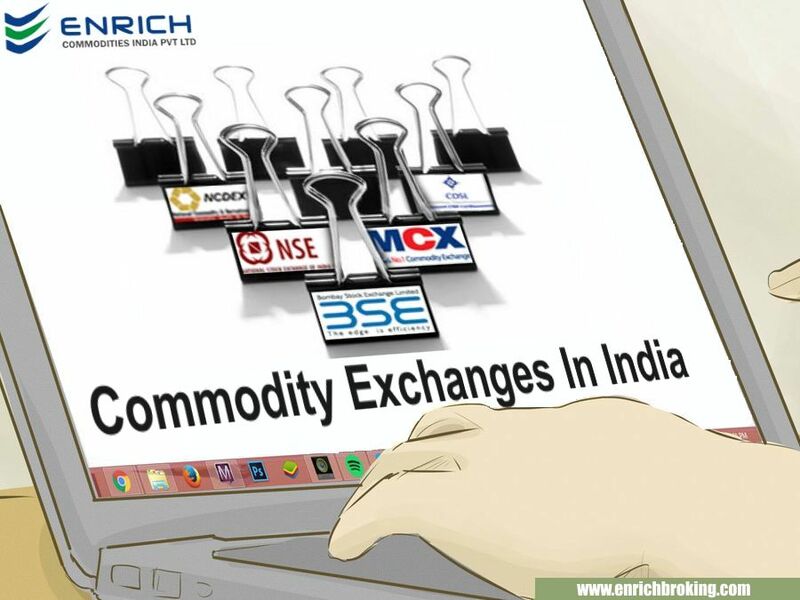 Headquartered in the financial capital of India, Mumbai, MCX is led by an expert management team with in-depth domain knowledge of the commodities futures market. The average daily turnover of MCX is around USD1.55 bn (Rs.7, 000 crores - April 2006), with a record peak turnover of USD3.98 bn (Rs.17, 987 crore) on April 20, 2006. MCX had more than 55% market share of the total trading volume of all the domestic commodity exchanges in the 1st calendar quarter of 2006. The exchange has also affected large deliveries in domestic commodities, signifying the efficiency of price discovery. MCX is well placed to tap the immense potential poised by the commodities market as it is a nation-wide commodity exchange having state-of-the-art infrastructure. National Commodity & Derivatives Exchange Limited (NCDEX) is a professionally managed on-line multi commodity exchange. CRISIL Limited (formerly the Credit Rating Information Services of India Limited. Punjab National Bank by subscribing to the equity shares has joined the initial promoters as shareholders of the Exchange. NCDEX is the only commodity exchange in the country sponsored by national level institutions. The institutional promoters and shareholders of NCDEX are well renowned players in their respective fields. Institutional building experience, trust, nationwide reach, technology and risk management skills are the strengths. NCDEX is a public limited company incorporated on April 23, 2003 under the Companies Act, 1956. It obtained its Certificate for Commencement of Business on May 9, 2003. It started its operations on December 15, 2003. It is a nation-level, technology driven de-metalized on-line commodity exchange with an independent Board of Directors and professional management - both not having any vested interest in commodity markets. NCDEX is synchronized by Forward Markets Commission. NCDEX is subjected to various laws of the land like the Forward Contracts (Regulation) Act, Companies Act, Stamp Act, Contract Act and various other legislations. NCDEX currently facilitates trading of 57 commodities.